Affect and effect are two highly misused terms which are often interchanged and confusing. As a verb, affect means "to influence." 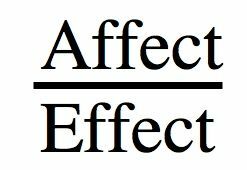 Effect as a verb means "to cause" but as a noun means "result." So a book might affect (influence) your thinking, but doing your homework will effect (cause) your grade (to be higher).